A Tennessee ALTA Title Survey is completed based on the “Minimum Standard Detail Requirements and Accuracy Standards For ALTA/ACSM Land Title Surveys.” This standards document was developed and is revised on a regular basis by a combination of Title industry and Surveying industry professionals. The latest version of this document is the 2011 revision. 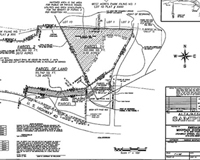 An ALTA Title Survey in Georgia is generally similar to a boundary or lot survey on a piece of property. But, the ALTA survey goes a little farther in the requirements on the land surveyor as he/she carries out the survey, both in the field and in the office. Since ALTA Surveys take more time and effort, these surveys typically cost more than a survey done according to a particular state standard. It should be pointed out that if the state standard is more restrictive on a certain point, then the most restrictive standard is required on the survey. I see ALTA surveys priced from 50% to 200% more than a comparable boundary survey. This depends on the items checked in “Table A – Optional Survey Responsibilities and Specifications.” This table adds additional or specific tasks to the surveyor’s scope of work. One item that is usually included with most all ALTA survey requests is Item #1, monuments placed. Most state standards probably include this and, in my opinion, all surveys should, but the ALTA survey leaves this optional unless the item is checked on Table A. So, if you have a commercial parcel or a large multi-family residential complex in the Ringgold area, you should consider asking for the ALTA survey standards to be used. You should also probably do this if you are considering the purchase or development of a parcel outside your state. Most of the banks will require this if you ask for a loan on this type property, but I recommend this even if the bank doesn’t require it. What are the requirements of the ALTA/ACSM Land Title Survey? Table A mentioned above is a very important part of the ALTA survey request. This table provides additional items, beyond the normal boundary information, that a client (owner or lender) might be interested in. If we can help you with an ALTA Title Survey in the future, please don’t hesitate to contact Ringgold Land Surveying at 706-222-3522 or fill out our contact form.